IMPORTANT NOTICE: The virtual plant includes a number of images -- THUMBNAILS are normally displayed.- DOUBLE CLICKING the thumbnail will access a high-resolution image. The Virtual plant has an on-line glossary. Clicking on underlined words, will pop up a small reference window, with relevant text, and an image, if this is available. The pop-up boxes are elastic and resizable. Click on this example, to see what happens ( click me The pop ups should close automatically after 30 seconds. Otherwise simply click on the "yes" button to close them. Primary roots have not been the subject of as many, or such full studies as has been the case of stems or leaves. They do, however, show a wide range of variation which is influenced both by environment, in terms of ecological adaptation, as well as by the genotype. Compared with stems and leaves, fragments can be difficult to identify in the primary state. This is not entirely because they are relatively undescribed or poorly represented in reference microscope slide collections, but partly since there is, overall, less variation. Roots have to take strains or pulling forces. It rarely has to bend or flex, since it is usually found in a more or less solid medium. In consequence of this, the main strengthening tissues are positioned in the central region of the root and function like a rope. Zea mays- origin of lateral roots, TS and LS. PLEASE REFER TO TECHNIQUES: 3, 7, 8 & 9. The root is an organ which has to take strain or pulling forces. It rarely has to bend or flex, since it is usually found in a more or less solid medium. In consequence of this, the main strengthening tissues in young roots are positioned in the central region of the root and the structure will function like a rope. 2. Uptake of water and nutrients. In all except aerial roots and the non-anchored roots of aquatic plants, root hairs are usually present a short distance from the growing apex. These develop from the rhizodermis or root epidermis. Root absorbtion is a relatively simple process. Examination of the younger parts of roots (those especially, that carry root hairs) present few barriers to absorption by plants. Whilst it is theoretically possible for absorption to occur anywhere it is most likely that absorbtion is greatest where root hairs exist, and the outer protective layer (the rhizodermis), and is most efficient just a few millimeters behind the root tip. Click here for more background information about root anatomy. The Ranunculus (Buttercup) root illustrates the relatively simple structure of a young dicotyledonous root. 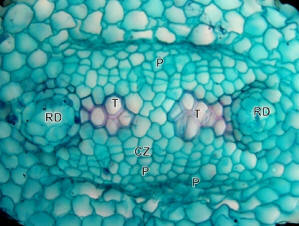 The xylem is tetrarch, and four strands of phloem alternate with the protoxylem. This root is just beginning to undergo limited secondary growth, with a cambial zone . Click here for a low power image of root. Epidermis. - fairly thick cuticle, with numerous epidermal hairs (trichomes) This region is more correctly termed the Rhizodermis, more especially so if examining the root nearer its tip and if the cells are associated with root hairs. Exodermis - the layer of parenchyma cells which form the outer surface, when the epidermis is shed. This is the outermost layer of cortical cells. Cortex (proper) - of parenchyma. In many of the sections, there are large air spaces in the cortex, bounded by parenchyma cells arranged in radiating plates. This is usually associated with waterlogged soil. Notice also, the smaller intercellular spaces and the presence of starch grains. Endodermis - a single layer of cells which constitutes the inner limit of the cortex. Note that the radial walls and the transverse walls (when in view) are lignified and contain a casparian strip, a characteristic feature of the root endodermis. Pericycle - a single layer of thin-walled cells, immediately endarch (to the inside) of the endodermis. This represents the outermost layer of the stele and in addition, is of importance in that it is the site of formation of lateral roots in higher plants. 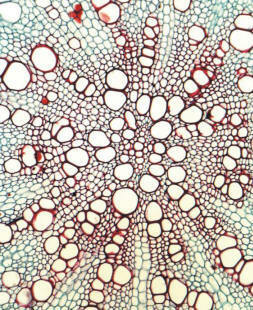 Xylem - seen in TS, as a lignified 4 or 5 rayed star. The points of the star, are the protoxylem and the rest is the metaxylem, which becomes differentiated from the outside, towards the inside of the root (i.e., it differentiates centripetally. This primary xylem, is composed of xylem vessels, the last formed and widest of which, lie at the centre of the stele. 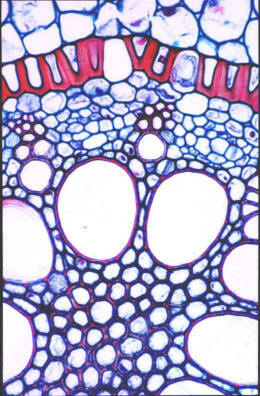 The arrangement of xylem, with the narrow-diameter protoxylem vessels lying towards the outside, is referred to as an exarch condition. 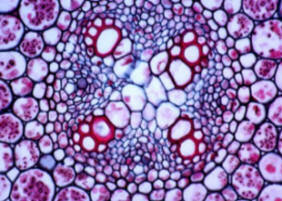 Phloem - strands of small cells, with dense contents, lying between the protoxylem points. The phloem is composed of sieve tubes and companion cells. The companion cells are much narrower-diameter cells than the sieve tubes. 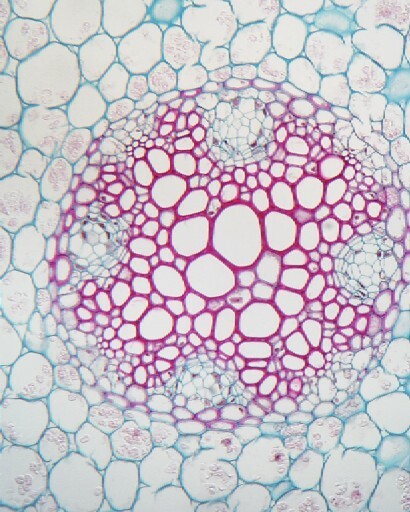 Procambium - after the primary xylem and the primary phloem are fully differentiated, a single layer of procambial cells remains between the xylem and the phloem. This layer is important, in that it is the origin of the vascular cambium. The Ranunculus root that you have looked at, is fairly typical of the anatomy of young herbaceous dicotyledon roots. 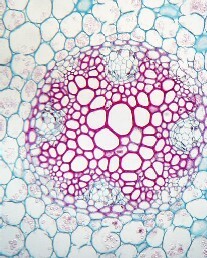 This example of a transection of a pea root has three protoxylem poles (triarch) It has started to undergo secondary growth, with limited secondary xylem (2X) and secondary phloem (2P) opposite the metaxylem (click here for a more detailed view). The cambium is spreading towards the protoxylem poles. The protophloem (double arrowheads) is crushed, and the remnants of this tissue are located between the protoxylem poles, at the periphery of the developing secondary vascular cylinder. The central core of this young root is composed of metaxylem vessels. The transection to the left shows the central core of a mature Helianthus root and illustrates the extensive secondary growth that can take place in a sunflower during one growing season. 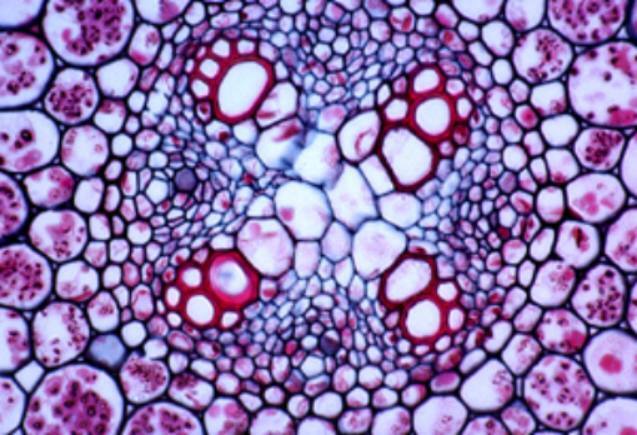 In the detail micrograph below, you can see that the xylem contains large-diameter secondary xylem vessels (V), arranged radially in files, and these are interspersed with narrower vessels and tracheids (T). Variable width parenchyma rays separate the xylem. .
Click here to see the central primary xylem core in more detail You should try to draw a representative portion of the root of Helianthus using the micrographs provided. 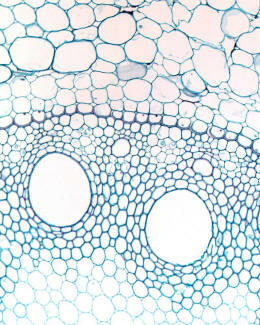 Monocotyledons usually have a large number of alternating groups of xylem and phloem. If you look at the photomicrograph which shows part of the root of Zea mays below, this statement should become obvious to you. Note the regular alternation of xylem and phloem, and the distinct junction between the cortex and the stele. Which tissue forms the boundary layer, endodermis or pericycle ? Again the Iris root is another example of a monocotyledonous root. In this example, we can see a very prominent endodermis -- seen here, as the layer of cells with striking thickening of the radial and inner tangential walls. The endodermis is the innermost layer of the cortex. The wall thickening forces water and other molecules to take a symplasmic route from the cortex to the stele, and vice versa, through the unthickened passage cells. Click here to go back to where you were before. Exodermis - this is a zone of relatively thick-walled cells. It consists of the outermost 3-4 layers of cells. Parenchyma forms a broad zone, making up the bulk of the cortex. Note that the cells are very large, thin-walled, surrounded by abundant intercellular spaces. Endodermis - in mature monocotyledonous roots, this layer of cells is very conspicuous. The cells are large and are tightly-packed (i.e., no intercellular spaces occur), to form a sheath around the vascular cylinder. The radial and inner tangential walls of most of these cells are heavily thickened and lignified. Opposite the protoxylem poles, the walls of the endodermal cells are unthickened: These form the passage cells. Pericycle - a single layer of thin-walled cells immediately beneath the endodermis. Xylem - arranged in a ring of 10 - 20 radiating groups (as against the 4 - 5 in dicot. roots). 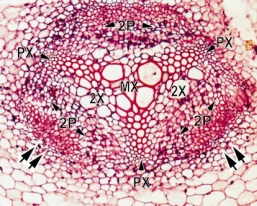 The xylem is exarch, consisting of small-diameter protoxylem vessels and tracheids to the outside, and wider metaxylem vessels towards the center of the root. 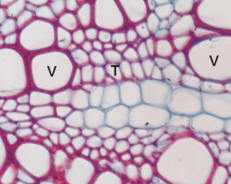 Phloem - as seen in TS, it forms small patches of thin-walled cells, alternating with the protoxylem poles. Parenchyma - lying between the xylem and the phloem. Pith - the central core of the vascular cylinder, which is usually composed of lignified parenchyma. Note that a pith is present in most monocotyledonous roots. The endodermis is the innermost layer of the cortex, which separates the vascular cylinder from the cortex. It occurs regularly in roots. Sometimes there is a band of suberin called the Casparian strip running round the radial and tangential walls of the cell. Sometimes, the whole wall is suberized. It is an important barrier, and the presence of the Casparian strip, as well as suberization, will regulate apoplasmic transport across the cortex to the pith, and from the pith to cortex. Passage cells such as those illustrated in the Iris root (click here to review this image) which generally lack thickened walls, are involved in symplasmic transport between the cortex and stele of root systems. The portion of a Zea mays root shown in the micrograph to the left, illustrates the arrangement of the separation of the cortical from the stelar tissues. Zea, like all primary roots, has an endodermis that forms the boundary between the cortex and the stele, and a layer immediately beneath this, the pericycle that is the outermost layer of the stele. This is an example of an atactostele. 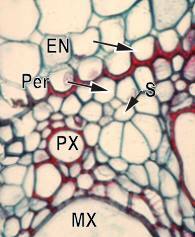 The micrograph (above left) shows protoxylem (PX) and metaxylem (MX vessels), and between these, a phloem strand. Detail from a mature root. The phloem in monocot roots is often reduced to a few sieve tube members, (S) surrounded by companion cells and associated phloem parenchyma. Note the conspicuously thickened endodermis, (EN) and beneath this, the pericycle, (Per) which forms the outermost later of the vascular cylinder. Epidermis, or rhizodermis (if associated with root hairs). The first root to emerge at seed germination, is the radical or primary root. This may persist and grow into a tap root, or as frequently happens in grasses and other plants, it may remain small, or disappear as the plant develops. The primary root may give rise to other roots, the lateral roots (sometimes called branch roots, or secondary roots that develop from meristems within the root, specifically from the pericycle. Lateral roots may themselves, also give rise to other lateral roots. All of these root types, constitute the root system of the plant. Anatomically, Gymnosperm roots are similar to those of the dicotyledons. They have a central core, which, in the young toot, is occupied by metaxylem elements. The protoxylem is exarch to the metaxylem, and the xylem poles in young roots are also, like the dicotyledons, few in number. Secondary growth, like that in the maturing dicotyledonous root, is initiated between the metaphloem and the metaxylem, with the cambium spreading laterally, until it forms a complete circle. You should make appropriate drawings and notes and consult texts such as Raven, Evert and Eichhorn; Biology of Plants for more details. Lateral roots have an endogenous origin i.e., they arise from deep-seated meristematic tissue, which is produced by localized cell division in the pericycle. The vascular system of the root becomes joined to the vascular system of the main root on which it is borne. When mature, the structure of the lateral root is the same as that of the main root, with epidermis, cortex, vascular cylinder, sub-apical meristem, root cap and root hairs. Lateral roots are borne only on the mature regions of the main roots, well above the region associated with the formation of root hairs. Why do you think this is so?